UPDATE: The two winners of the giveaway are Tiffany K. and Kittee – congratulations! The nice folks over at Harvard Common Press let me know that Robin Robertson—seasoned chef, food blogger and highly acclaimed author of 19 well-known cookbooks—will be releasing her latest cookbook, Fresh From the Vegan Slow Cooker, in early October, and are offering two free hot-off-the-press copies through this blog post. I’m excited about this new release because I already own two of Robin’s cookbooks, Vegan Fire and Spice and Fresh from the Vegetarian Slow Cooker, which I love, refer to and use often. Robin’s new cookbook is filled with innovative ideas, tips and recipes for your slow cooker, which include dips, pâtés, innovative soups, filling main courses and desserts. It’s also a great reminder that slow cookers are not only a convenient tool in the kitchen, but also amazing vessels for creating a countless array of unique and delicious recipes. 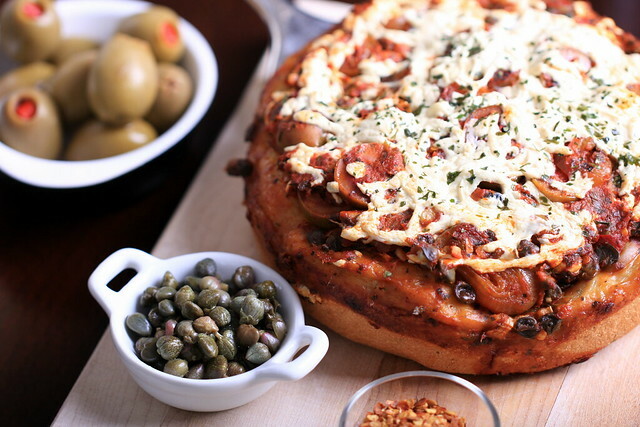 One fresh and novel idea among many included in Robin’s cookbook is her Puttanesca Pizza (pictured above). Homemade dough is placed into the vessel to create a deep-dish style pizza, which looks and tastes absolutely amazing. After about 20 minutes, it creates a beautiful aroma and, when it’s done, produces a perfect crust with a pillowy soft center. During cooking time, the toppings develop a complex taste and texture, creating the perfect pizza without a lot of work. I love this recipe and method for its ease and innovation, which is a common theme throughout Robin’s new cookbook, which includes other amazing recipes like caramelized onion soup, seitan ropa vieja, slow-cooker pho and french toast bread pudding. Now, on to the giveaway! Two lucky readers who comment on this post will each receive a new copy of Robin’s latest cookbook directly from the publisher. (To be released on October 2.) To enter the giveaway, you may enter separate comments for any or all of the following to be entered into the drawing, and I will use random.org to choose the two winners. post a link to this giveaway on Facebook. All comment(s) should include some way to contact you in the case you are a giveaway winner. The giveaway will close at midnight on September 28 and the two winners will be announced at 9 a.m. ET on September 29. Good luck! hello! looks like i might be the first to commment?! my fave cookbook of robin's is "quick fix vegan" the first vegan recipe i tried came from that cookbook, Vietnamese tofu wraps, and after that, I was hooked! favorite slower cooker recipe….. something sweet like apple cobbler! My favourite slow cooker recipe is apple butter! I love Robin's book 1000 Vegan Recipes! My husband and I love making taco soup in the slow cooker. Quick and convenient! My favorite cookbook is Vegan Fire and Spice! So good! I strongly suggest the lentil/veggie sambar. My favorite slow cooker recipe is overnight oatmeal! I don't have a favorite vegan slow cooker recipe, I haven't used my slow cooker in years … but judging by Robin's recipes and some of the comments above, I need to explore! Yum! Kristin Troska (facebook): My fav slow cooker treat is my friend's hot chocolate cake in the crockpot. Kristin Troska (facebook): Favorite cookbook is Quick Fix Veg. Steel cut oats or quinoa! My favorite Robin Robertson book is her vegetarian slow cooker book. It was one of my first vegetarian cookbooks, and I used it a ton. Not exactly a recipe, but I like to slow-cook beans for the freezer to save money over buying canned. I'd love to win a copy. I love my crock pot, I use it to make stock and beans. I am a long-time fan of Robin's books, but my favorite is The Vegetarian Meat and Potatoes Cookbook. Can't wait to sink my teeth into her new book! I love slow cooked breakfast foods and then soups and stews the best! I pinned this on pinterest.com/lhochan. I love to make oatmeal in the slow cooker! Vegan Planet is one of my fave cookbooks! Gosh, it's so hard to pick just one recipe. Right now my favorite recipe is skillet lasagna-so easy and so good. Also the truckstop risotto from "1000 Vegan Recipes". I've pinned on Pinterest, tweeted and shared on FB. Thanks. i like slow cooker chili! I love the pot roast seitan recipe from Vegan on the Cheap. My favorite slow-cooker recipe! I love Quick Fix Vegan soooooo much! Every recipe I've made from it has been super-easy and surprisingly creative and delicious (for something made so fast). It's one of my favorites. Also, my favorite slow cooker recipe is actually the "recipes" (they're more accurately called "instructions") for cooking your own tomatoes and beans and stuff to freeze and use instead of cans, and also the homemade boullion cubes, all in the first section of The Vegan Slow Cooker. I love stew in my slow-cooker! Thank you so much for this awesome giveaway! Vegan Planet is a standard go-to cookbook in my library. I just tweeted the contest! Spicy Moroccan Chickpea Stew is my favorite. Thanks! My favorite slow cooker recipe is fresh garden tomato sauce with vegetables from my outdoor garden. I serve it over quinoa with some fresh grated cheese and it's delicious with a glass of red wine. Rice pudding is my favorite slow cooker recipe, hands down! Vegan Fire and Spice is my favorite Robin Robertson cookbook! Hard to pick a favorite cookbook, but I like Vegan Fire & Spice, and Vegan Planet. Tough to pick a favorite slow cooker recipe… Pretty thrilled with making beans (so easy!) and breads and monkey bread, especially during the summer. valeri.caskey@att.net: My favorite Robin Robertson cookbook is 1000 Vegan Recipes. I've only just started slow cooking, so I don't have a favorite recipe yet! Vegan Planet is my favorite Robin cookbook! Oh MY I NEED this cookbook! I love making refried beans in my slow cooker, I have the recipe posted to my blog if anyone is curious! Turns out great and freezes well. Quick-Fix Vegetarian and Vegan on the Cheap are two of the best cookbooks around. Thanks for offering the giveaway! My favorite of Robin Robertson's cookbooks so far is Quick Fix Vegan, we adapted her "Freeburgers" to be nut free (used sunflower seeds instead) and love that they were already gluten free so they are an allergy friendly choice for our family! My favorite Robin Robertson's cookbook is 1000 Vegan Recipes. It was my first vegan cookbook. I have a hard time picking just one favorite slow cooker recipe… my two favorites are curried split pea soup and the etouffe from Fresh from the Vegetarian Slow Cooker. I'm so excited for the sequel! My favorite Robin Robertson book is Vegan on the Cheap. It is easily the most used cookbook in my ridiculously large collection. One of my favorite and most used crock pot recipes is your overnight oats! My favorite Robin book is Vegan on the Cheap! The Spinach-Potato Quesadillas from Robin Robertson's Party Vegan is one of my favorite recipes. Right now my favorite slow recipe is black bean, rice and kale soup from "Vegan on the Cheap". I think it's hard to choose but right now I'm using "Vegan Planet" alot. And I shared on FB.Thanks for the chance to win. I made Robin's Black Bean Soup with Kale and Rice this morning. It turned out great. This is her Vegan on the Cheap crockpot recipe. I love this cookbook and all of her suggestions. I bought a breadmachine and have been making her bread recipe too! I love making applesauce in my slow cooker! I own a number of Robin's cookbooks. My current favorite is The Vegetarian Meat and Potatoes Cookbook. I have most of her books but my favorite is Vegan Planet. I have never tried vegan crockpot cookery! I have only made my fave BBQ chicken in the crockpot. I would love to win this so I can start vegan crockpotting! As a new vegan, I don't own any cookbooks of my own yet, but I've been hoarding a copy of Robin's Vegan Planet that I checked out of the library for several weeks! Every recipe I've tried has been fantastic! My favourite thing to cook in the slow cooker is a criollo lentil stew. My favourite book of Robin's is Vegan on the Cheap. Most recipes are easy but full of flavour. My favourite thing to make in the slow cooker is a criollo lentil stew. I don't actually own a slow cooker, but really want to get one soon! I have seen so many yummy bean stew recipes – one of those would for sure be my favourite. My favorite Robertson cookbook is vegan planet. Favorite slow cooker recipe is definitely vegetable bean soup. Soup! Butternut squash soup with coconut milk. YUM. I love slow cooker recipes! My favorite has to be steel cut oatmeal or brown rice pudding! The flavors are amazing an soak in better than a stove top or oven! Shared and FB. My favorite cook book by Robing is 1000 Vegan Recipes. I don't make a lot of slow-cooker recipes, but I have made some soups that turned out pretty good. I liked the African Sweet Potato Lentil Peanut Stew I made once. Unfortunately I tryed only 1 recipe, but my favorite is "The Vegetarian Meat & Potatoes Cookbook", because I read a lot of recipes there what seems very tasty! I cook vegan food, but never cooked it in the slow cooker. This book sounds great. My favorite Robin Robertson cookbook is 1,000 Vegan Recipes. We've never had a bad meal from that! A slow-cooker vegan chili is always delicious and easy too. I really love to make Apple Butter in the slow cooker–it's a great holiday gift! I love Robin's book, "Fresh from the Vegetarian Slow Cooker". My slow cooker is my favorite kitchen appliance, and there is a nice variety of types of foods and flavors in this cookbook. I echo what someone said earlier: my favorite slow cooker recipe is not really a recipe but a technique. I LOVE cooking dried beans in a slow cooker! There's no soaking required, and of course, cooking beans from dried yields a much tastier result – not to mention it's so much cheaper! Oh wow! So glad I stumbled upon your blog! I too am vegan and dating a meat and potatoes type of guy. He does eat my creations and always talks them up to his friends which I think is adorable  But I am always looking for heartier dishes that will satisfy him. So glad I found your site! Fav slow-cooker recipe: There are so many…vegan chili, lentil soup (any soup really), rice pudding…I’m now hungry! It’s so easy and I love coming home after a long day at work to an already ready meal and my apartment smelling so divine! I used to be afraid of my slow cooker. I'm not sure why. But TODAY I made vegan lasagna in it! I think I am being converted to slow cooking!! I can't wait for Robin's book to come out!! With the fall weather upon us, I'm eager for some warming soups and stews for dinner! I love making chili in my slow cooker! Just wish my kids would eat it – I need new ideas! I'm so excited about this book! Also, I pinned you pizza, because it looks amazing. I just got Robin's Quick Fix Vegan and absolutely love it! Can't wait to check this new one out! I am a little boring with my slowcooker use. My favorite 'recipe' is to use it to make seitan. No braininess! I generally use the recipe from Appetite for Reduction. I've been vegan for four years but I'm new to slow cooking! So far I have made chili from my own recipe, slow simmered for hours with beans, peppers, onions, mexican beer, etc. I'm really looking forward to this cookbook! 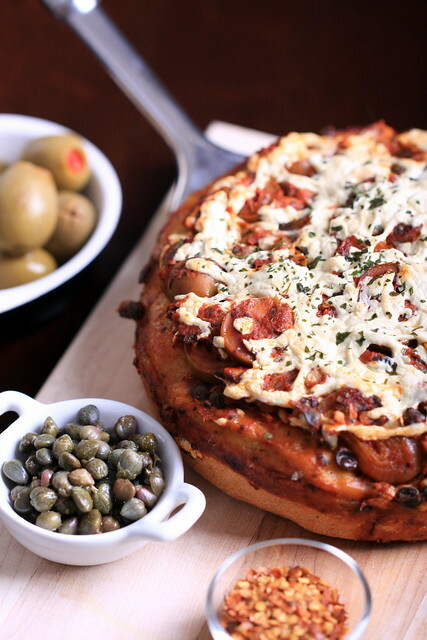 I don't have a favorite slow cooker recipe yet, but that pizza looks and sounds amazing! My favorite slow cooker recipe is a simple bean and rice dish – rice, pinto, black beans, olive oil, onions and some spices. Simple, healthy, cheap! My favorite slow cooker dish is a Vegan Mexican Lasagna I make… simply delicious!! I love Robins 1000 Vegan Recipes book!! But all of hers are great!! I have many of Robin's cookbooks, with easy to make, easy to get ingredients. I would love to win "Fresh from the Vegan Slow Cooker".